Picking a restaurant these days is no easy task. First of all, you need a good guide. But to find the best restaurant in Florence, you're going to have to do more that just consult Tripadvisor. Instead, it would be better to make use of a rather more prestigious guide, historically significant and known around the world: the Michelin Guide. Among the luxury Italian restaurants that have won 3 Michelin Stars (the highest award possible), only one is located in Florence - the Enoteca Pinchiorri. This restaurant has for twelve years earned the aforementioned Michelin Stars, as well as its fame as the best restaurant in Florence. The idea of the enoteca was brought about by two exceptional people: Giorgio Pinchiorri and Annie Feolde. Giorgio is Italian and is the soul of the Pinchiorri cantina and its wines, while Annie (who is French) takes special care of every single order that comes out of Pinchiorri's kitchen. Their story began in the early 1970s, when Florence was dominated by family run trattorias while the rest of the world was witnessing the birth of high cuisine. In those days, the couple worked together at the Enoteca Nazionale located on via Ghibellina, when on one beautiful day in 1972 Giorgio began to open highly prized bottles of wine to sell by the glass. The idea was a hit with clients and an immediate success, so much so that wine tastings followed thanks to the addition of Annie, who created small dishes to accompany the wines selected by Giorgio. A few years later, in 1979, Giorgio and Annie decided to transform their informal buffet into a culinary experience of the highest level. 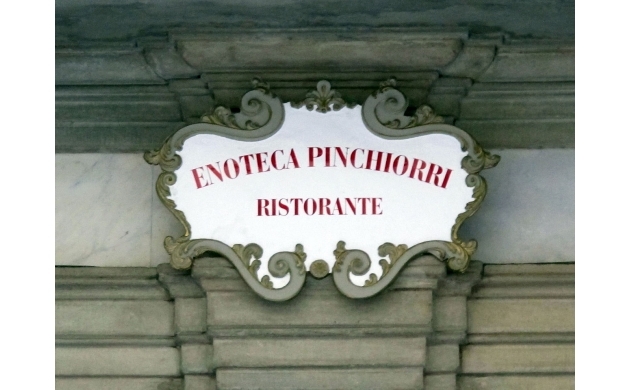 And so was born the Enoteca Pinchiorri. The Enoteca Pinchiorri is located in the center of Florence, in a historic building with modern decor and an attention to contemporary design. On the inside are located private rooms side by side with some tables hosted in an elegant sixteenth-century courtyard. Inside we also find a few crazy details, scrupulously curated by the restaurant team, which is headed by Giulio himself, who not only is the founder and owner of the Enoteca, but who also personally picks the flower arrangements. Tuscan-themed nineteenth-century paintings and classic table settings form the final details that welcome guests as they enter the dining room. Pinchiorri is without a doubt a restaurant capable of satisfying any desire; a restaurant with perfect service, and, overall, a restaurant which is absolutely charming and luxurious. Annie came to Italy when she was 26 years old with a firm desire to work in the world of restaurants. Starting with her knowledge of Tuscan cuisine, Annie went from accompanying the plates of her partner, to (after long studies in wine and gastronomy) finding incredible success - becoming just the fourth woman in the world to receive three Michelin Stars, and the first one outside of France. Assisting Annie are Executive Chef Riccardo Monco, Head Chef Alessandro Della Tommasina, and the young Pastry Chef, Luca Lacalamita. The Enoteca Pinchiorri is certainly the number one restaurant in Florence, but we shouldn't forget that we are also talking about an Enoteca: a real wine bar. And, in fact, it is wine which is the king of the house, with the cuisine as queen, accompanying and supporting each other at each and every turn. This has been the idea of Pinchiorri since the very beginning, and the reason for its success. Over the years Giorgio has amassed a collection of over 100,000 bottles, among them the best and most prestigious in the world. In fact, Giorgio's maestro Luigi Veronelli has called this cantina "immense, legendary, inimitable". So much so that the value of the bottles in the collection has been estimated at around 100 million euros. The Enoteca Pinchiorri is located within the historic Palazzo Jacometti-Ciofi, on via Ghibellina 87. For more information you can visit the website of the local.